Were you a sherbet lemon or chocolate lime fan? Soft chewy ones or hard boiled sweeties (you do get more for your money that way)? The jangle of your pocket money . . . the rustle of the pink and green striped paper bag . . . 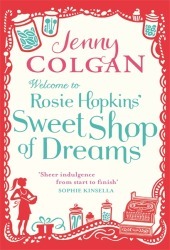 Welcome to Rosie Hopkins Sweetshop of Dreams, a novel, with recipes. If you are looking for a sweet, scrummy, heart warming tale with comedy and romance a-plenty, you’ve found it! This was such a lovely novel, one that I knew I couldn’t wait to read! As soon as we meet heroine Rosie and find out that she has been asked to leave bustling London and move to a quiet sleepy village in the middle of nowhere, we know that fun and capers is going to ensue! This book has something for everyone. The storyline is strong covering Rosie’s struggles to come to terms with her new country life, aging Lillian who still wants to be completely independent, her rocky relationship with boyfriend Gerard and the various other men she encounters along the way! There are also fabulous descriptions of the countryside, making the reader want to take a trip to the country pub or go for a walk with Rosie on the hillside, and lets not forget the fabulous sweet shop scenes which make your mouth water and will definitely leave you wanting to return to the sweetshop of your childhood and indulge in your favourite sugary concoction! As in her previous novel ‘Welcome to the Cupcake Café’ the author has included recopies and snippets from the former shop keepers ‘log’ and this really adds to the magic escapism of the book. If you think it is going to be all countryside and no action, however, you’re in for a shock. With a handful of men to contend with, Rosie and the other characters have enough romance and controversy to keep any modern woman happy! If this book hasn’t managed to make it onto your summer reading list, fear not! It will make the perfect companion to cosy autumn nights in (roaring fire optional). Sweet Shop? Cupcakes? I'm down - anything set in/based around/talks about a bakery? I'm game! This sounds like a super sweet, fluffy, cold day kind of read! Just added this to my library list...I love books like this! Sounds like a fun, happy read! You make it sound delightful!